As I mentioned in a previous Décor post last December, Fontanini Nativity Display, one of the highlights of our home decoration during the holiday season is our nativity set. Over the years, in both our California home and in our Midwest home, I added more figurines and accessories. Months before Christmas, I search the internet for ideas for my nativity display but most of the websites only show finished displays and never go into much detail or have instructions on how to make those displays. For this post, I thought it would be interesting to show step by step how I set up this year’s Fontanini Nativity Display. The first step is laying down a base or foundation for the display. This particular base that I am using for this year’s nativity display was recently bought at a local craft store after Halloween on a clearance sale for very little money. 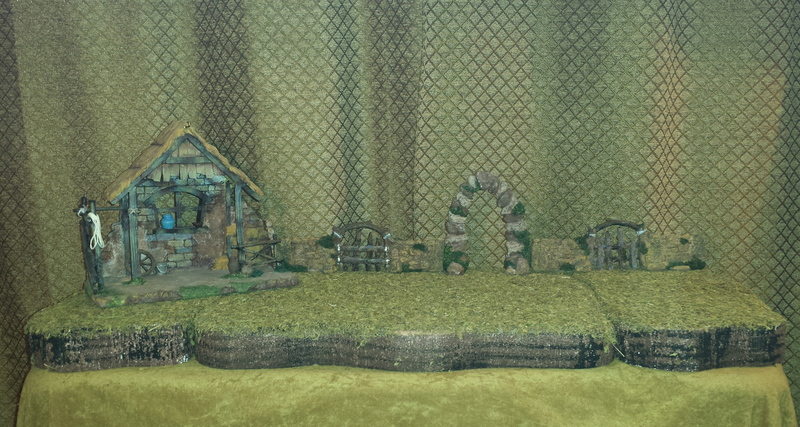 I think the three part sections with a moss surface work wonderfully for the nativity set display; the three sections interlink for one flat surface or can be stacked in a variety of positions. I like the flexibility because every year I’m always thinking of different ways to display or change my Christmas decorations and I can also use the bases for different holidays, such as my Haunted Mansion display for Halloween. This year, the place I choose to display the nativity set was on a table in front of the window in the library of our home. First, I start by covering the table with a large piece of brown fabric. Next, I positioned the three sections of the base to lay flat across the entire top surface of the table. For this year’s nativity display, I set the nativity stable in the left corner of the base at a slight angle. Then, across the back of the display, I positioned two resin sections of a “rock” fence and in the middle a “rock” resin piece in the shape of an arch. I have a catalog which lists all the figurines and display pieces available but the Fontanini pieces are very expensive to purchase. The three display accessories that I am using for my nativity display background are an example of using non-Fontanini pieces that coordinate beautifully but are available at a much lower price. During the year I always keep my eye out for accessories that would work with our Nativity set and these three pieces were bought at a minimal piece during a summer clearance sale at a local craft store. This is a great example of buying smart and keeping the cost down! 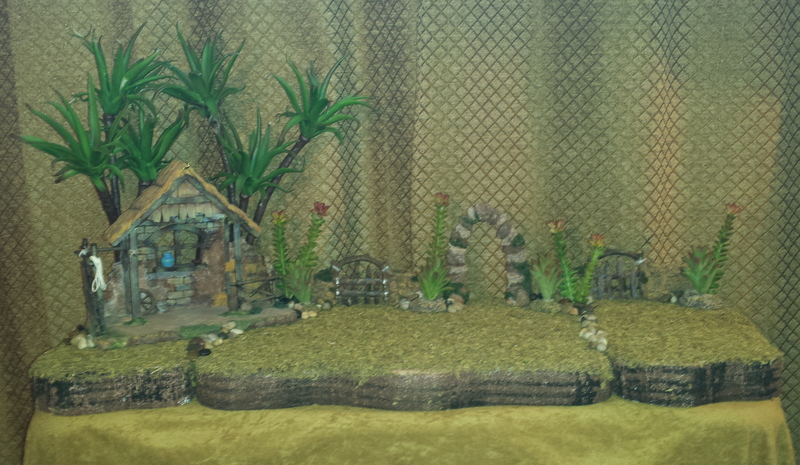 The next step when creating a nativity display is adding trees and plants for a more natural setting or scenery. For this year’s display, I used two sets of palm trees and you may notice in the nativity photos from the previous years that the palm trees look very different. After last Christmas, I decided the palm trees were starting to show some wear and need repairs since I had been using these same trees for over 30+ years. To the start the repair process for the palm trees; I purchased artificial cactus plants from a local craft store that resembled a more realistic palm tree shape. I removed the leaves and wrapped the palm tree trunks with brown floral tape. I choose this method to repair the palm tree trunks because, even though paint would have worked to repair the damage, the floral tape added more support to hold the slightly heavier cactus plants which weighed more than the previous plastic palm leaves. After using the floral tape, I hot glued the cactus plant to the top of the tree trunk. The refurbished palm trees were positioned behind the nativity stable and I think the finished look is more realistic then the previous version! Next, I wanted to add more plants to the nativity scene because in previous years the display was a little too sparse. Once again, in the floral section of a local craft store, I found artificial cactus plants and these were placed along the back of the display along the “rock” wall. Then, to finish the landscape of the display, I had purchased a small bag of rocks and these were added to the base of the back wall and in front of the stable; I also used several rocks to cover the seam of the display base. Over the years, I keep adding to the nativity display and have purchased several accessories pieces during after Christmas clearance sales or from ebay at discounted prices during the off season. 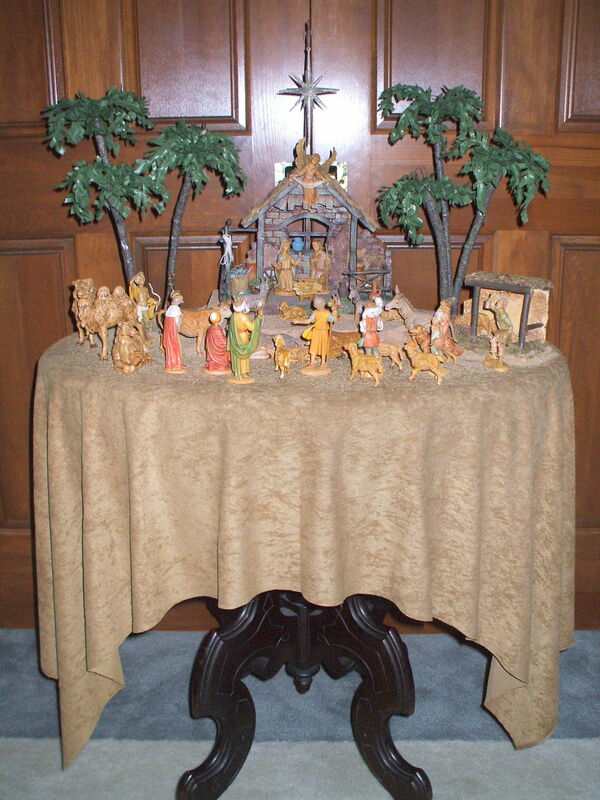 I added these items to the display to create a more realistic look to the nativity scene. Several of those pieces included food item figurines, such as clay pots filled with grain or baskets filled with olives or fish. I also added a campfire for the three wise men and a well for the villagers. To add more substance to the well created a base. I used a piece of Styrofoam which was cut and then given a rounded contour to resemble a rock foundation or platform for the well. To further the illusion, I carved grooves into the Styrofoam to simulate the individual rocks and then painted it with several different colors and adding green paint to appear as if moss was growing along the base of the well. During the 30+ years that we have had our Fontanini Nativity on display during the Christmas season, I have added several new animal figurines. I have purchased some at regular price but most of the pieces have been bought during after Christmas clearance sales or from ebay at discounted prices throughout the year. These animals included several ox and donkeys, a couple of goats, almost a dozen sheep, a shepherd’s dog and three camels for the wise men to travel to Bethlehem to see the baby Jesus. All these animal figurines are scattered across the display creating a sense of movement and activity that adds life to the scene. As stated in an earlier Décor post, Fontanini Nativity Display from December 2012, after years of searching I finally found my perfect nativity set that I wanted at Jule Hus in Solvang, CA. I bought a beautiful Fontanini “starter” set that included a stable, Gloria the angel, Mary, Joseph and baby Jesus in a manger. So, this initial purchase included the most important main pieces to my nativity display. Since that time, and over the next 30+ years, I have added several figurines. Some of those early purchases included several shepherds to tend the herd of sheep. Other figurines were added to the display, including several villagers of various occupations. Another important group of figurines are the three wise men who have traveled from far to honor the newly born Jesus and bring him gifts of frankincense, myrrh and gold. All these nativity characters are scattered across the display telling the story of the birth of Jesus. Every year I try and keep our family’s interest by display the nativity set in different rooms or creating different displays from year to year, it is constantly changing location of new figurine or accessories are added each year. At our house in California, I have had the nativity set displayed in the hallway on an antique sewing machine and on top of a chest of drawers in our living room. 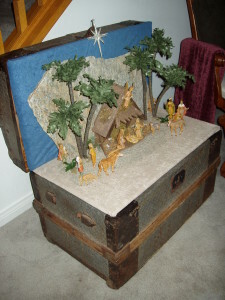 One year, I displayed the nativity set inside an antique trunk with a large flat rock as the background for the scene. 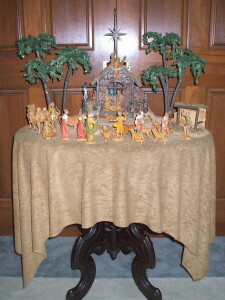 In our house in the Midwest, I have displayed it on the top of an old piano and a few years ago the nativity set was displayed on an antique table that my husband’s Grandmother kindly gave to us before she passed away last year. This heirloom table is very special because it has been in her family for a very long time. For the last two years the nativity set has been displayed on a table in the library of our home … who knows where the Fontanini Nativity Display will be shown next year! One of our family traditions every year during the holiday season is that the manger in the nativity display stays empty until Christmas Eve. On that evening we read from a beautifully illustrated book that tells the story of the birth of Jesus. After we are done reading, my daughter will put baby Jesus in the manger and we say a prayer. It is a lovely moment to remind us of the true meaning of Christmas. 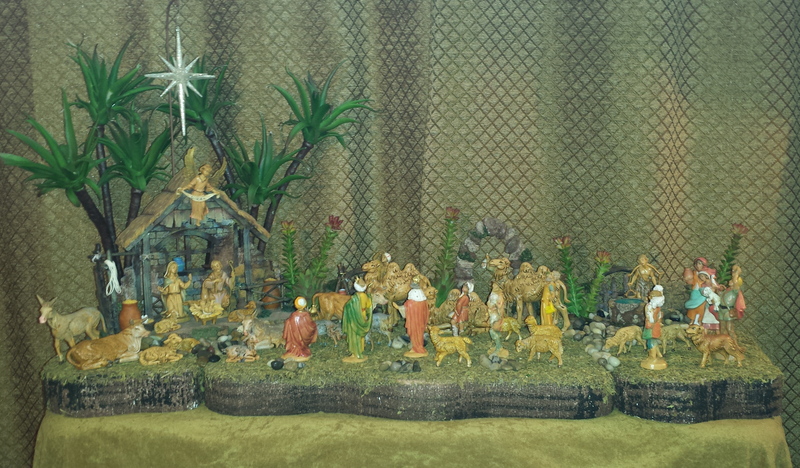 When decorating our home at Christmas it is never complete until we set up the nativity set. 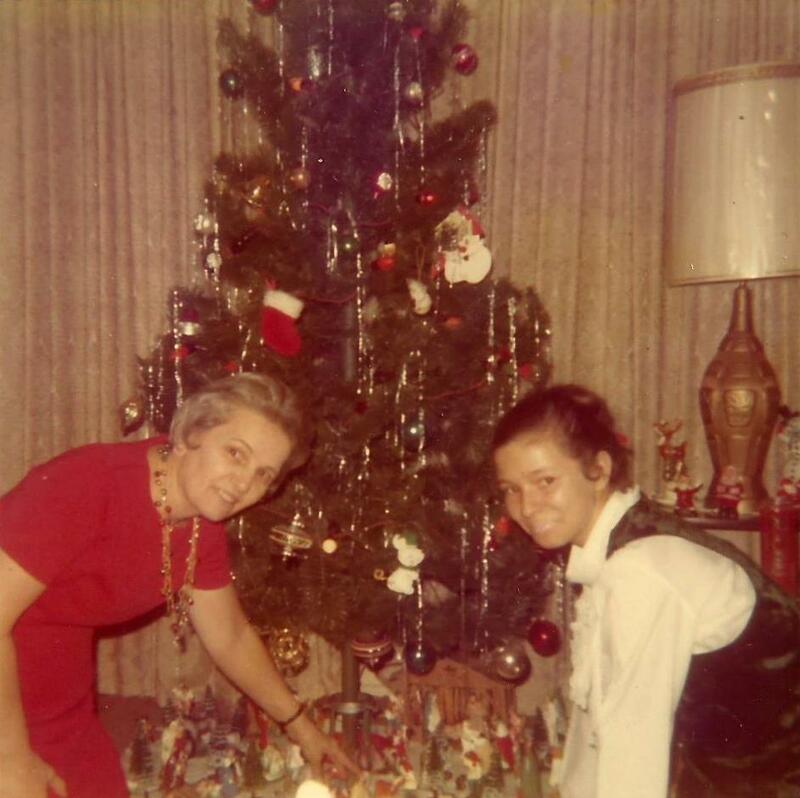 When I was a child my mother had a beautiful nativity set with hundreds of pieces that she always set up under our Christmas tree every year. I remember lying on my stomach and just looking at that display. Sometimes when my mother wasn’t looking, I played with the pieces. Unfortunately, after my mother passed away this year, I don’t know what happened to her nativity set. It would have been nice to have one or two pieces for remembrance! When I first got married and started decorating my own home, I knew I wanted a nativity set. I took my time looking for the right one. There is a wonderful Christmas store in Solvang, California that has been there since 1967 called Jule Hus. (solvangschristmasstore.com) They sell beautiful Old European glass ornaments, German Nutcrackers, Christmas Angels, and Fontanini Nativity sets. We loved going to the store whenever we visited Solvang and it didn’t matter what time of year because as soon as we walked through the doors it was always Christmas! After years of searching I finally found the perfect nativity set that I wanted at Jule Hus. 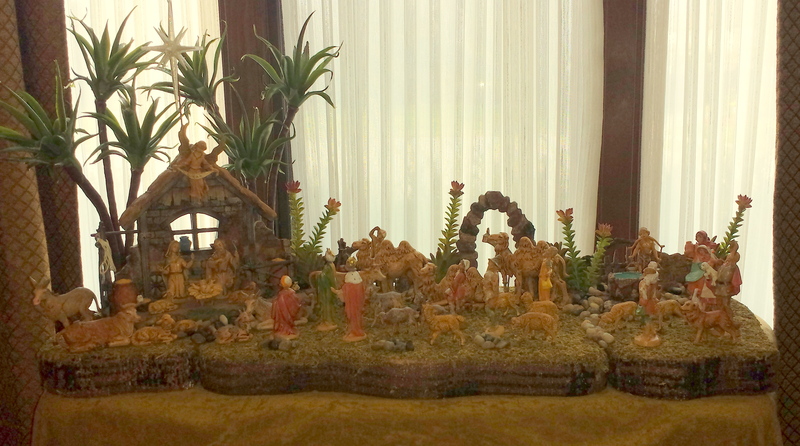 I bought a beautiful Fontanini set that included a stable, Gloria the angel, Mary, Joseph and baby Jesus in a manger. 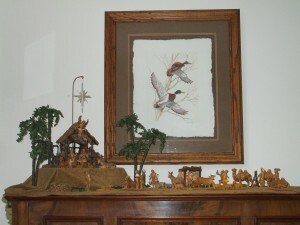 Over the years I added more pieces; the three wise Men and their camels, shepherds and their flock of sheep, also a set of ox, donkeys and goats, palm trees and a star that hangs suspended over the nativity set. 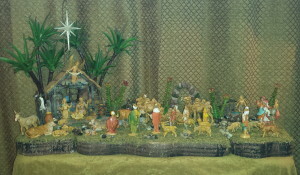 It will never be as big as my mother’s nativity set, but it is small enough to display anywhere in the house. We have display it in an oak cabinet in our California house. Now that we have moved to the Midwest, I have displayed the nativity set in several different places, such as: in the library on top of an old piano from Germany and last year I had displayed the nativity set on a lovely heirloom table that we received from my husband’s Grandmother. 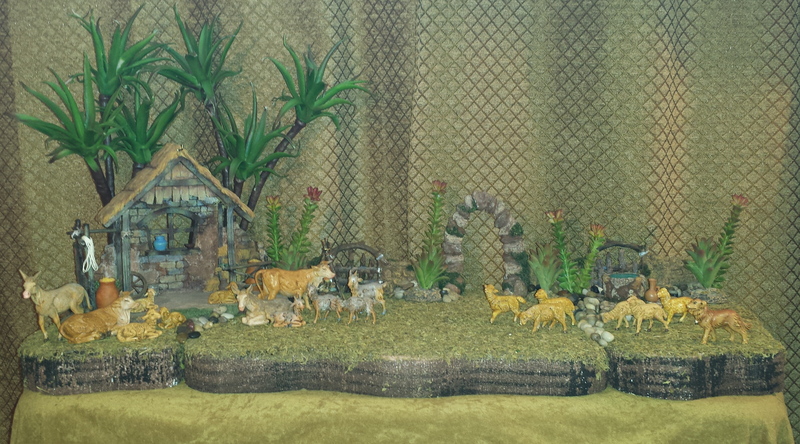 One thing remains the same no matter where it is displayed, traditionally the manger stays empty until Christmas Eve. On that evening we read from a beautifully illustrated book that tells the story of the birth of Jesus. After we are done reading, my daughter will put baby Jesus in the manger and we say a prayer. It is a lovely moment to remind us of the true meaning of Christmas and a family tradition that we love to celebrate every year. A nativity scene or crèche depicts the birth of Jesus. 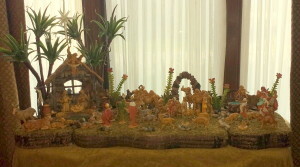 The main figures are the infant Jesus, Mary, and Joseph. Other figures include angels, shepherds and the three wise men known as the Magi. Usually the scene takes place in a barn or stable with Mary and Joseph and a manger for Jesus. 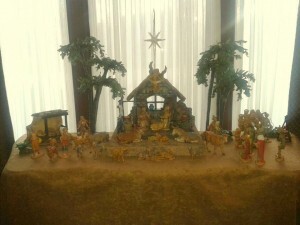 Usually displayed with nativity are various animals such as a donkey, ox and the camels belonging to the three wise men. 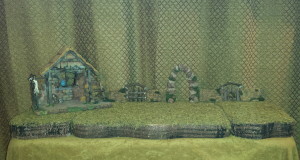 Sometimes, more elaborate nativities will display different scenes from the village, such as: the Inn and the Innkeeper and the other village merchants and craftsmen. During the Christmas season, the tradition of the nativity scene is created all around the world. There are many different types of nativities that represent the various countries and the cultures of the native people. Known as the Szopka, the traditional Polish nativity dates back to the 13th century and was originally carried from door to door by performance groups that told the story of the birth of Jesus. There is a famous annual competition held in Krakow’s main square and prizes are awarded for the most elaborately decorated nativity scenes. The construction of these modern nativity scenes often use the design elements found in Krakow’s historic architecture and include Gothic spires, Renaissance facades and Baroque domes. 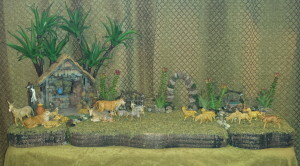 Mass produced nativity sets are now available worldwide in all different types of materials and every price range. One of the most successful companies is Fontanini. The House of Fontanini was founded in 1908 in Bagni di Lucca, Italy. They produce and hand paint cast resin figures in several different sizes that range from 2.5″ to 50″ tall. The most popular sizes are the 5″ and 7″ figurines and are currently distributed by the Roman Inc. since 1973. They are usually sold by Christmas ornament suppliers such as Bronner’s. (www.bronners.com) These treasured nativity pieces are very collectible and would make a great family heirloom to pass onto future generations. 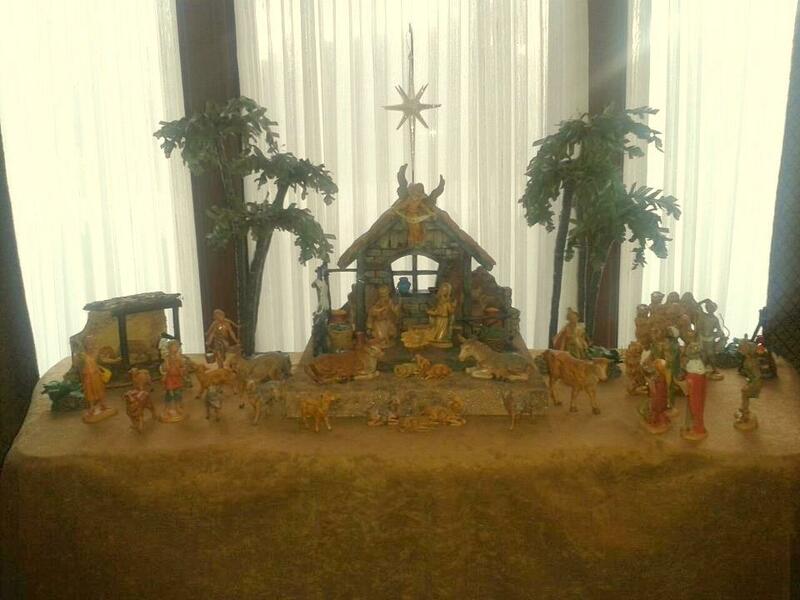 If you also display a Nativity Set, I would love to see your photos!